Kate Gavino launched her book Last Night’s Reading at Housing Works, but the event was as much a celebration of literary readings as it was the book. 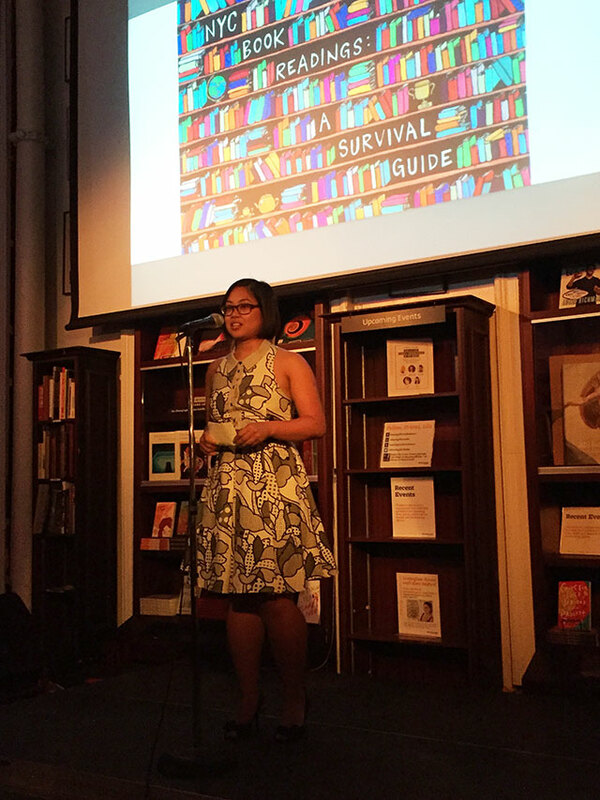 She assembled an A-List cast of authors to read embarrassing stories, and she presented a slideshow survival guide to literary events. New York City’s literary community provides a vast assortment of events. Most nights of the week, there are multiple readings in places as expected as bookstores and as surprising as graveyards. Some readings are ongoing series, others onetime events designed to promote a book or publication. Gavino has attended more than four-hundred, a number that keeps growing. Gavino considers herself an observer first and foremost, and it was at an event with Junot Diaz that she first decided to launch the website. Up until then she jokes, Tumblr was just to look at pictures of pretty British men. Writers should be treated like rockstars, Gavino contends, and that is the goal of the website and the book. Over the last several years she has been attending three to four readings each week, and in some cases spent her weekends at large book events covering dozens of authors. The process is exhausting. There are some pro-tips that Gavino has for attending readings. First, choose a good seat, she says and remember that whomever is sitting next to you will be sharing that space for the next forty-five to ninety minutes. Many readings have free food and drinks. “Its why most people go to readings,” she jokes. Or maybe she isn’t joking. Tumblr graciously sponsored snacks and drinks at Housing Works for the launch of her book, so Gavino had those covered. Bigger events will have food dedicated to press coverage. The food isn’t all that good, but the perks are: “I’ve ended up eating lukewarm lasagna with a lot of my heros,” she says. Though Gavino attends a lot of readings, she doesn’t often get author’s signatures. She is much more interested in the things they have to say about craft, writing, and general life advice. She did get one signature though: Babysitters Club author Ann Martin. For more photos of the event, check out the English Kills Review Tumblr.